Used for overhead panels in civilian aviation, Korry utility control system (UCS) technology replaces separate display and switching components.Â Functions can be changed by updating software, and triple redundancy involves 3 displays, each withÂ 2 channels, that allow for one channel to be down without interfering with normal aircraft operation. Other features include anti-fingerprint surface; high-brightness, high-contrast display; open architecture; and sizes from 3ATI to 15.4 in. EVERETT, Wash. – Esterline Control & Communication Systems is launching its utility control system (UCS) touchscreen display technology, part of its Korry line of cockpit controls and displays and the first touchscreen control solution for overhead panels in civilian aviation. It replaces a number of separate display and switching components while increasing flexibility and reliability and can be adapted to individual aircraft requirements. What is now the Korry UCS technology was originally developed by Esterline in a precursor application as a touchscreen display for the overhead panel of the Gulfstream G500 and G600 long-range business jets. Esterline is a lead contractor to Gulfstream Aerospace Corporation for the G500/G600 flight deck. 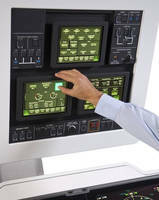 "It's an industry milestone for Esterline to develop touchscreen display technology specifically for overhead panels in civilian aviation," said Kevin Moschetti, president of Esterline Control & Communication Systems. "After pioneering this application for the business jet market, we are now making the technology available in a format easily adapted to a wider range of aircraft." The Korry UCS display technology will be on display at the NBAA 2015 Business Aviation Convention and Exhibition in Las Vegas, November 17-19, in booth C12838. Flexibility: control-panel functions can be changed by updating software instead of changing hardware. Triple redundancy: three displays, each with two channels, allow for one channel to be down without interfering with normal aircraft operation. Anti-fingerprint surface: novel surface technologies allow skin oil to stay on the operator's skin instead of the display surface. High-bright / high-contrast display: all information is readable in direct sunlight even at wide angles. Reliability: reduction of separate switches by more than 75 percent minimizes the potential for failure; the glass screen is designed for life-of-the-aircraft durability. Open architecture: customers can implement their own look and feel for the control interface. Ergonomics: control activation is secure in varying conditions, including turbulence, and with different types of contact. Design values: the technology can be packaged in a sleek, low-profile format ideal for new-generation aircraft. Multiple touchscreen display sizes: a range of sizes from 3ATI to 15.4 inches is available for various applications. Esterline Control & Communication Systems (www.esterline.com/controlandcommunication) designs and produces leading technology control and communication components and subsystems for today's advanced requirements, focusing on delivering high-reliability human-machine interface (HMI) solutions to its customers across the globe. It is a wholly owned subsidiary of Esterline Corporation (NYSE: ESL), an international specialized aerospace and defense company headquartered in Bellevue, Wash., that employs about 13,000 people worldwide.